The Kaiser Chiefs are back in flames, writes Jackson Langford. “Education, education, education, then and now the key to the door of Britain’s future success,” said former UK Prime Minister Tony Blair in his famous speech about the power of education in 2005. Add in the already aggressive term ‘war’, and not only do you have the title of the Kaiser Chiefs’ fifth album, but you have a perfect summary and encapsulation of utter belligerence and frustration that is present throughout the album in its entirety. We’re immediately presented with quite a confronting tone: seagulls squawking in the distance, the hushed rumbles of a storm approaching and your typical Kaiser Chiefs synth. This infectious yet fiery tone present in the opening track generally is consistent throughout the album. The album, however, does stray from the revolutionary theme occasionally, namely in second track Coming Home. Sounding like it would have resided perfectly in the late 90’s pop/rock scene with acts like the Goo Goo Dolls and Oasis, the track seems less likely to incite a riot as it does to incite nostalgia. 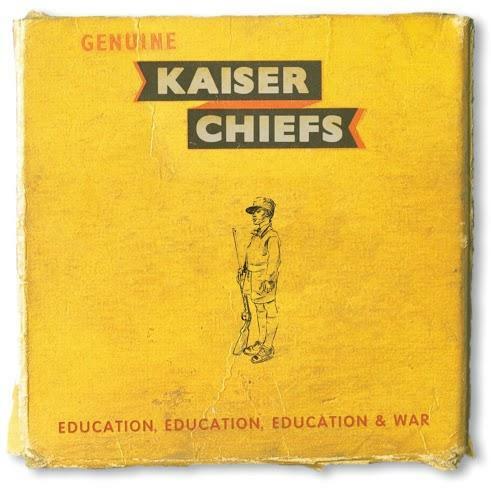 An ode to the Kaiser Chiefs that once was, perhaps? Founding member/ex-drummer Nick Hodgson had left the band to concentrate on his other projects, and was replaced with Vijay Mistry. It definitely ties in with the overall theme of the album: look at your past fondly, but be ready to tackle the future head on. Education, Education, Education & War is passionate and irresistible throughout the duration, whether it is passionately aggressive or passionately nostalgic. The boys are back, with a fire in their eyes and it would be a downright shame if those flames weren’t fanned.